Pochoirs, an etching, a lithograph, and two serigraphs. 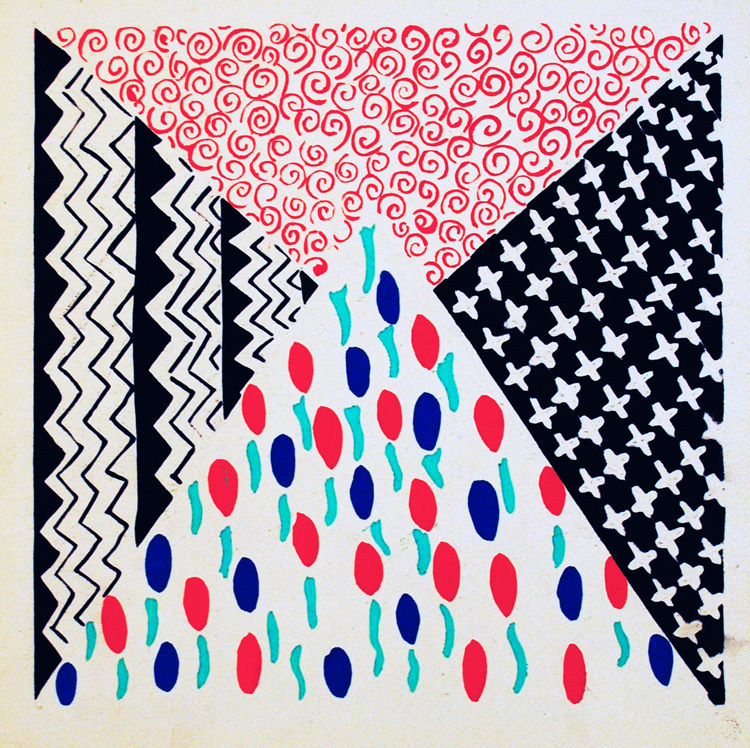 Composition 30. Original color pochoir, c. 1930. Published in Compositions, Couleurs, Idées (Editions d'Art Charles Moreau, Paris, 1930). I have not been able to find any information about the size of the edition, but I would guess that it was fairly small. All pochoirs printed on wove paper heavy enough to stand by themselves if leaned against a wall or an easel. All sheets show some browning at edges of sheet. Image size: 208x158mm. Price: $850. 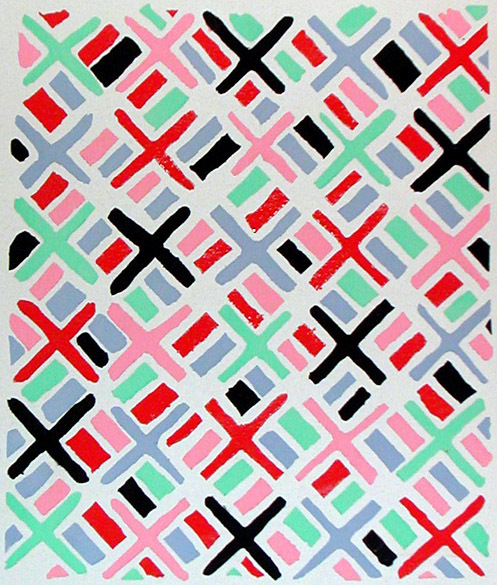 Composition 31. Original color pochoir, c. 1930. Published in Compositions, Couleurs, Idées (Editions d'Art Charles Moreau, Paris, 1930). I have not been able to find any information about the size of the edition, but I would guess that it was fairly small. Two paper losses at crease about 5mm above the bottom of the sheet but not affecting image (which ends about 58mm above the bottom of the sheet). All pochoirs printed on wove paper heavy enough to stand by themselves if leaned against a wall or an easel. All sheets show some browning at edges of sheet. Image size: 233x208mm. Price: $950. 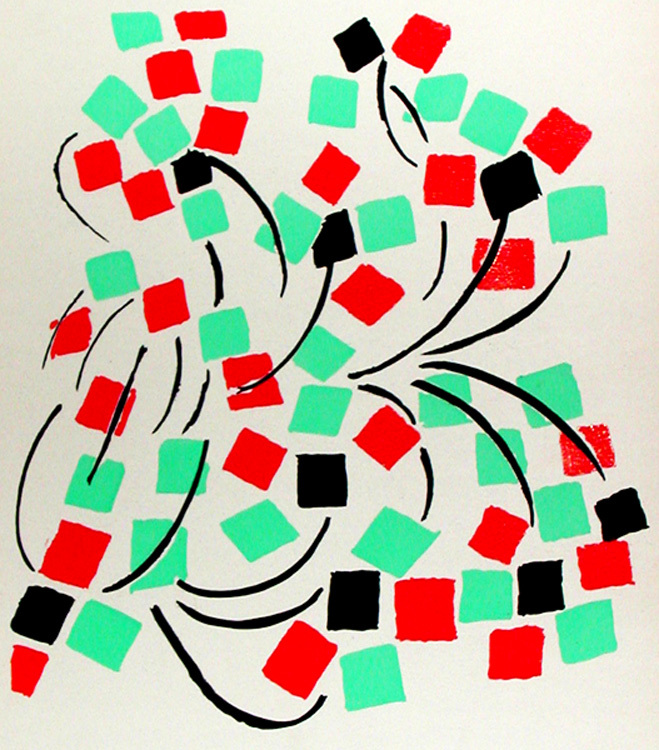 Composition 32. Original color pochoir, c. 1930. 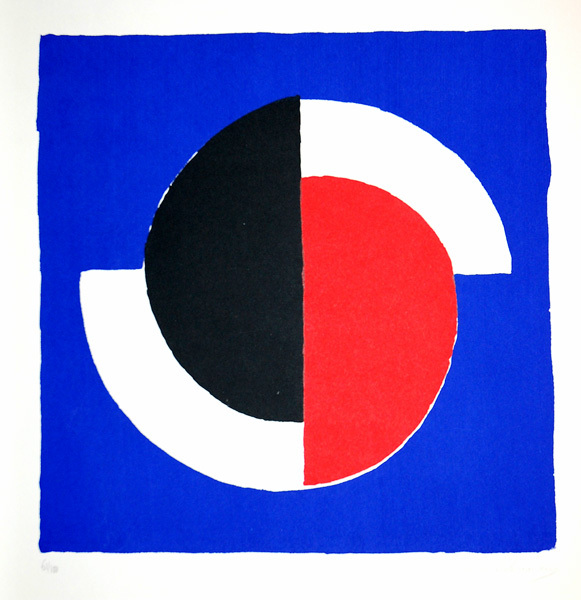 Published in Compositions, Couleurs, Idées (Editions d'Art Charles Moreau, Paris, 1930). I have not been able to find any information about the size of the edition, but I would guess that it was fairly small. All pochoirs printed on wove paper heavy enough to stand by themselves if leaned against a wall or an easel. All sheets show some browning at edges of sheet. Image size: 252x195mm. Price: $950. 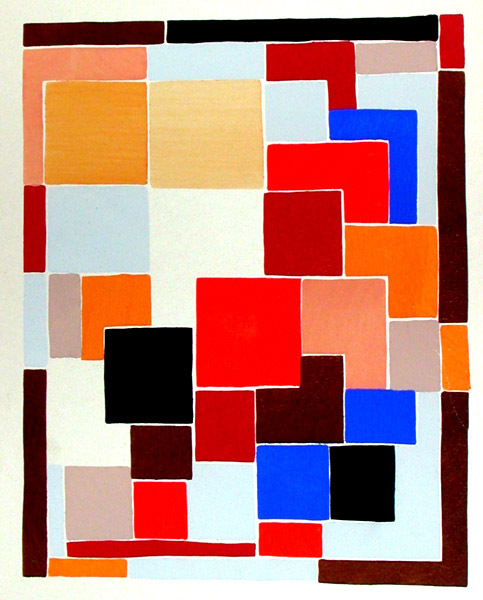 Composition 34. Original color pochoir, c. 1930. 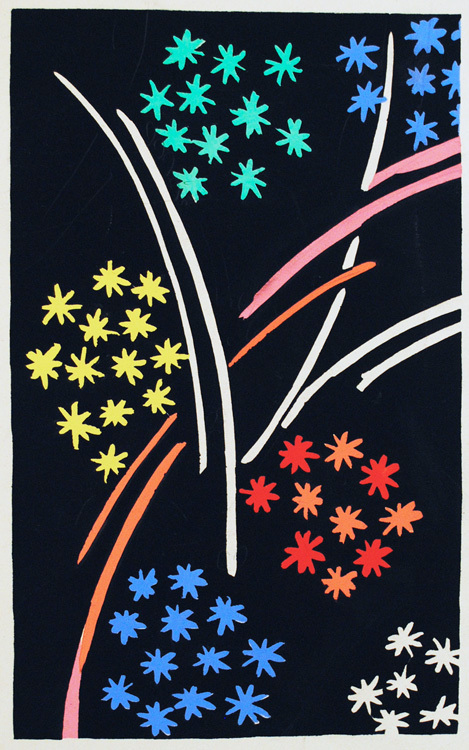 Published in Compositions, Couleurs, Idées (Editions d'Art Charles Moreau, Paris, 1930). I have not been able to find any information about the size of the edition, but I would guess that it was fairly small. All pochoirs printed on wove paper heavy enough to stand by themselves if leaned against a wall or an easel. All sheets show some browning at edges of sheet. Image size: 179x152mm. Price: $850. Composition 35. Original color pochoir, c. 1930. Published in Compositions, Couleurs, Idées (Editions d'Art Charles Moreau, Paris, 1930). I have not been able to find any information about the size of the edition, but I would guess that it was fairly small. All pochoirs printed on wove paper heavy enough to stand by themselves if leaned against a wall or an easel. All sheets show some browning at edges of sheet. Image size: 250x153mm. Price: $950. Composition 37. Original color pochoir, c. 1930. Published in Compositions, Couleurs, Idées (Editions d'Art Charles Moreau, Paris, 1930). I have not been able to find any information about the size of the edition, but I would guess that it was fairly small. All pochoirs printed on wove paper heavy enough to stand by themselves if leaned against a wall or an easel. All sheets show some browning at edges of sheet. Image size: 175x153mm. Price: $850. Composition 39. Original color pochoir, c. 1930. Published in Compositions, Couleurs, Idées (Editions d'Art Charles Moreau, Paris, 1930). I have not been able to find any information about the size of the edition, but I would guess that it was fairly small. All pochoirs printed on wove paper heavy enough to stand by themselves if leaned against a wall or an easel. All sheets show some browning at edges of sheet. Image size: 180x181mm. Price: $850. Composition Red, Blue, Black, White. 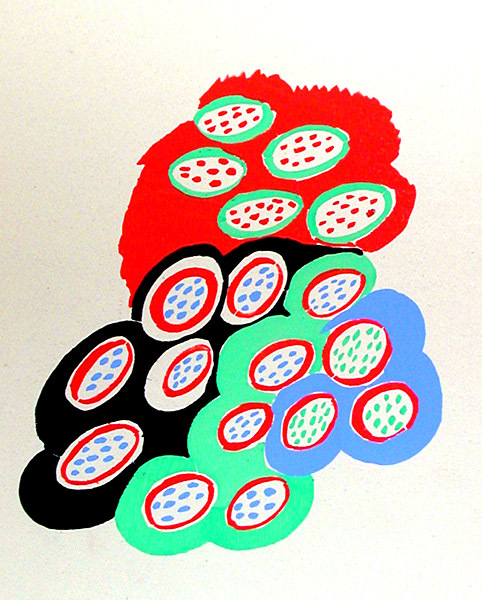 Original color silkscreen, 1964. 100 signed and numbered impressions on Arches, of which this is n. 61/100. Before we purchased it, it had suffered three tears in the blue area lower left and upper left, apparently from broken glass, and had been backed with wax paper for support. We have had it repaired and restored (our restorer formerly worked at the Hermitage State Museum in Petersburg, Russia). From normal viewing distance, the flaws are virtually invisible; if you go looking for them, you can find them. Without the original damage, we would have priced it at $3500. Image size: 400x398mm. Price: SOLD. Abstract Composition. Original color etching, c. 1970. 125 signed and numbered impressions. Image size: 494x395mm. SOLD. Composition for XXe Siecle. 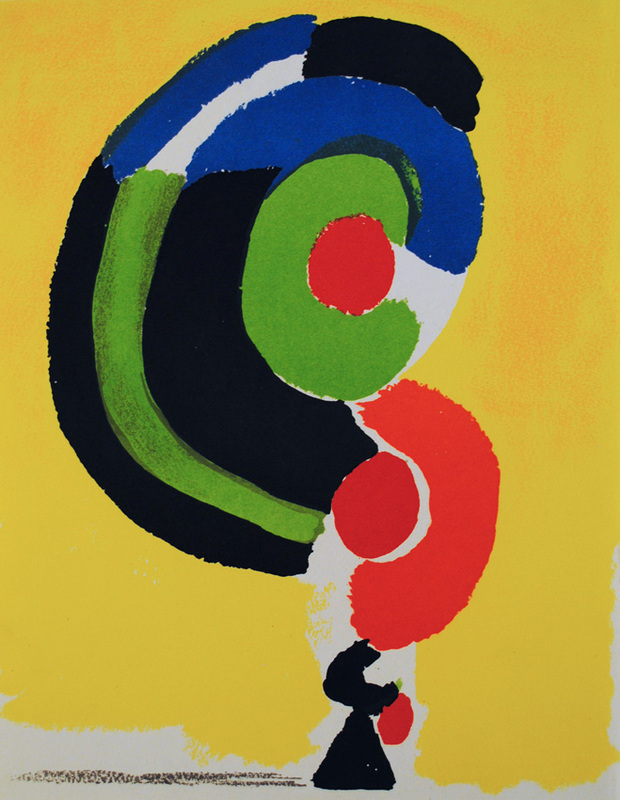 Original color lithograph, 1972. Edition c. 3000. Published in the deluxe art review XXe Siecle in 1972. 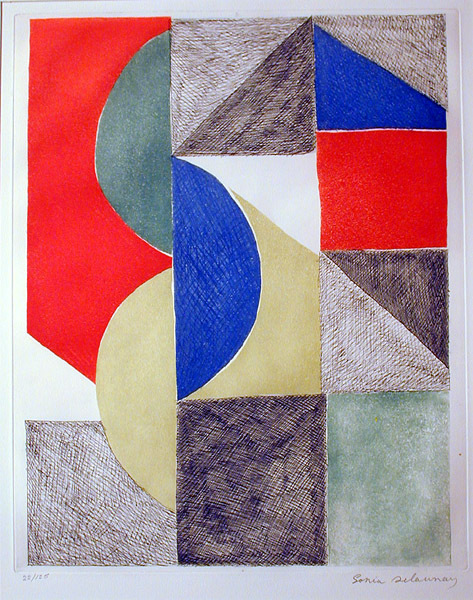 One of Delaunay's late lithographs showing once again her mastery of color and technique. Image size: 311x242mm. Price: $400. Composition. 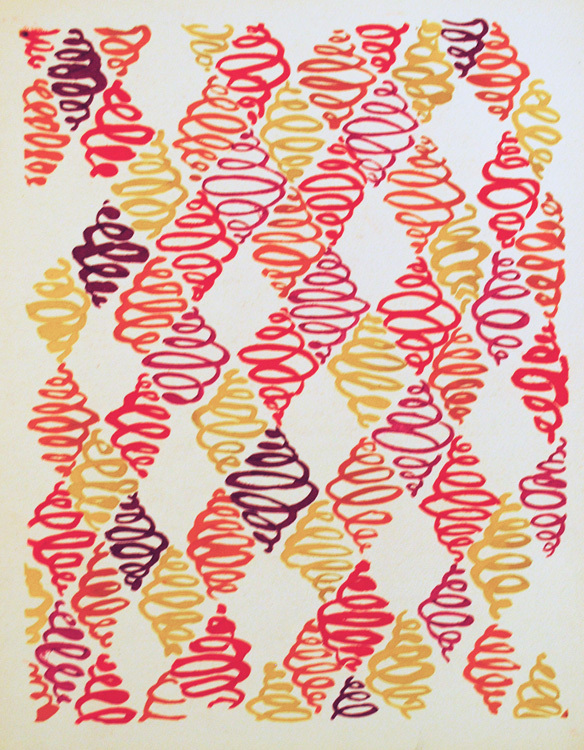 Original color screenprint, c. 1970. This large, untitled work is signed but not numbered. It may be a proof before an edition or a trial prooof or a monotype. 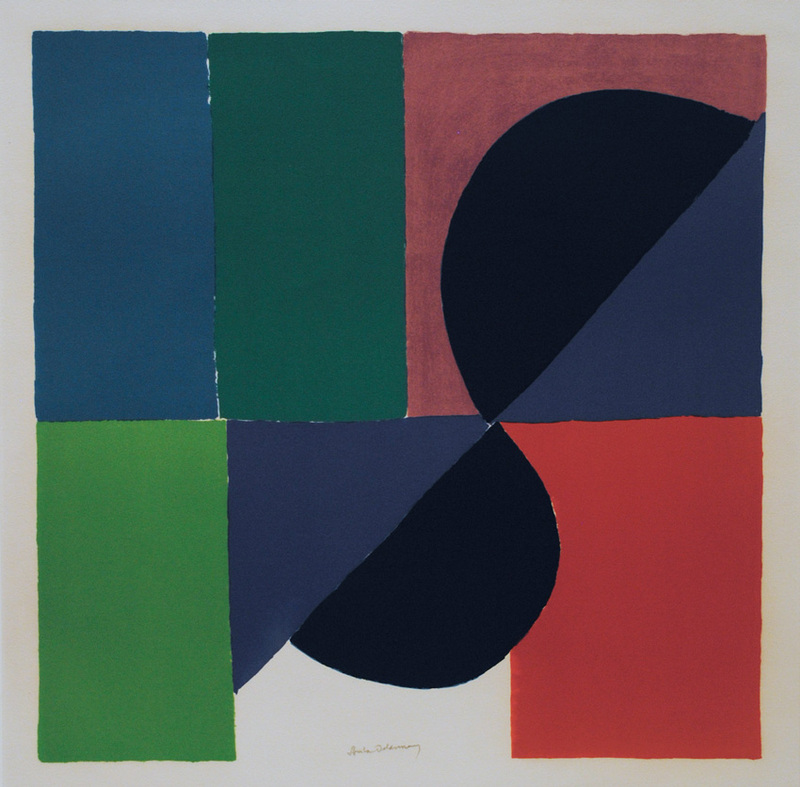 Interestingly, nost of the colors are the basics of Delaunay's visual vocabulary, but the wine-colored area top right is less familiar. 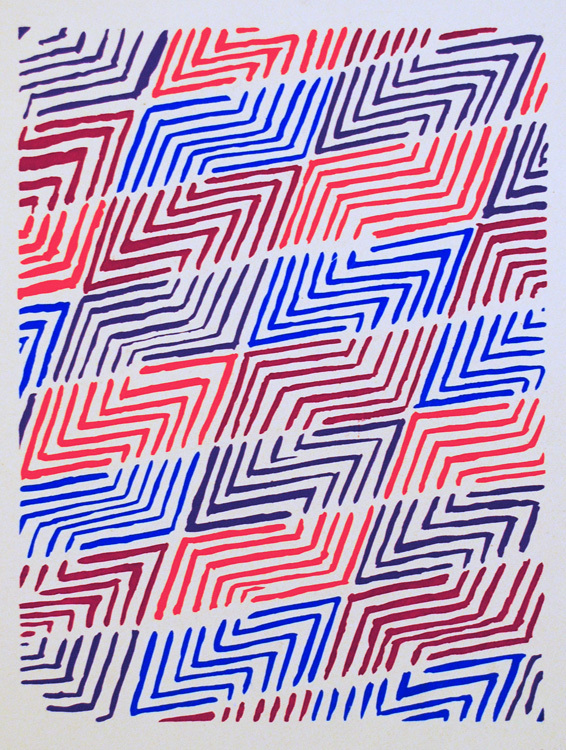 Printed on a large sheet of wove paper. Sheet size: 705x653mm. Image size: 497x497mm. Price: $3750.